Volumetric Flask are made of Polypropylene. These flask volumetric are strong, unbreakable and have good contact clarity. These autoclavable flasks are provided with screw caps to prevent leakage. 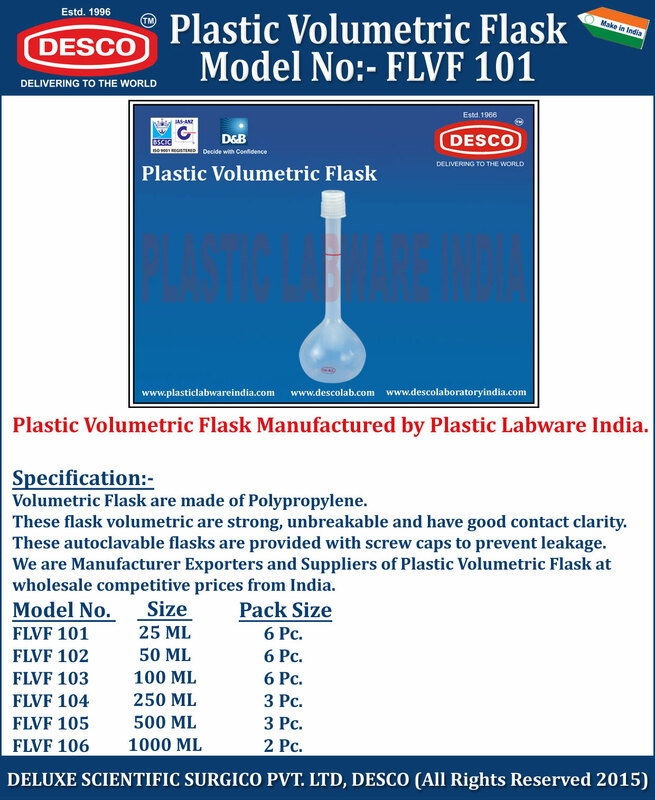 We are Manufacturer Exporters and Suppliers of Plastic Volumetric Flask at wholesale competitive prices from India. FLVF 101 25 ML 6 Pc. FLVF 102 50 ML 6 Pc. FLVF 103 100 ML 6 Pc. FLVF 104 250 ML 3 Pc. FLVF 105 500 ML 3 Pc. FLVF 106 1000 ML 2 Pc.